Google officially introduced its new “Instant” search for desktop search at an event today in San Francisco, but I couldn’t help looking forward a little bit toward using Instant on a mobile device. Google already has a prototype, and says the new functionality will become available for mobile devices this Fall. This could be a valuable app indeed if the connection speed to the device is fast enough and reliable enough. And that’s a very big If on today’s 3G networks. But Google Instant for mobile might really come of age with faster 4G networks. Google was showing off a prototype of the mobile app here today, and it already looks impressive, that is, while it’s connected over Wi-Fi and not 3G. The app is still in development, so Google is still working out how to best replicate the Google Instant experience for mobile. For instance, on the desktop, if you accept the search term that Google predicts you’re about to type out, you just hit the Tab key. But there is no Tab key on most mobile keyboards, so the developers much figure another mobile-friendly way to accomplish what the Tab key does on the desktop. The beauty of Google Instant is that it could save you a lot of typing on your mobile keyboard, which is a hassle—especially if your phone has no physical keyboard. I imagine the use case goes something like this: On your Android phone, you open up Google search in a browser window. 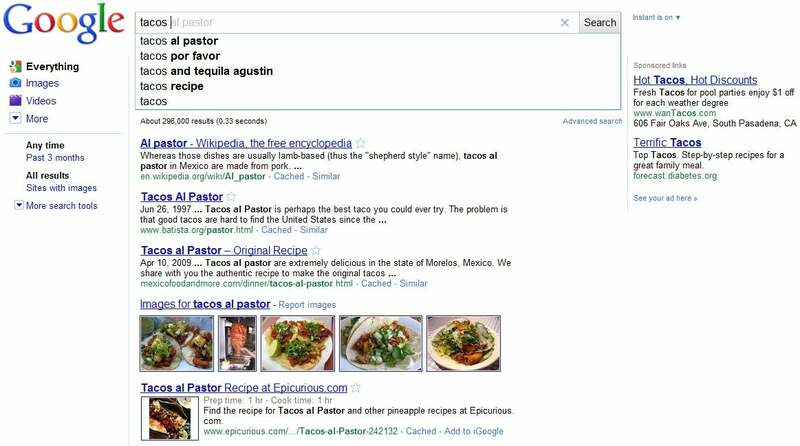 To start your search you hit the microphone key and begin speaking your search terms. As you say the words the search engine is not only trying to guess the next word in the phrase, but is also displaying search results for the search terms it’s guessing. Reviewing those search results helps you gauge how close you are to finding content you want, and gives you ideas for what keywords to use next. If you don’t know exactly what your searching for, or exactly what search terms to use to find it, the search results suggest content that might be useful. The search engine’s ability to constantly suggest search terms and search results might be extra useful to a mobile user. Being mobile often means running searches to find information you will act upon right now—things like navigating new terrain and trying to find one’s way, or trying to find out what’s around (restaurants, landmarks, etc.). So a search engine that is actively pushing answers at you in real time seems valuable. But, again, this all depends on a fast and reliable wireless connection. Google Instant requires a constant communication back and forth between the client (your phone) and the server (Google’s search servers). Watching Google Instant in action on a wired connection, you notice that it takes a little time for the server to return new search results for each new search term it guesses for you. Google says it takes about 300 milliseconds. But that interval might turn into several seconds or more if your device is using a slow connection. Then the process bogs down, “instant” is no longer instant, and the new functionality becomes a hindrance instead of an aid.